I’ve wondered over the years just how much of my connection to God is the result of pain. I can’t answer that but what I do know is that pain is a strangely effective guide. I learned this in a whole new way when chronic pain rearranged my life without so much as a by-your-leave. When my everyday pain level got to a certain threshold, I had to resign my job, drop my plans for midwifery school, and stop driving a car. Most of the things that defined my adult, decision-making, competent self were stripped away. I didn’t make those decisions willy-nilly either: I believed God called me to be a midwife, and so did the Christian midwife who was training me. Then, suddenly, I couldn’t even drive myself across town, let alone stay up all night with a woman in labor. What happened? Where could I go when my life just didn’t work anymore? I was in a significant amount of pain nearly all the time, getting things done was nearly impossible, and so was thinking. To a person who mostly lives inside her head, not being able to think is excruciating. So I did what made sense at the time: I shut down. It did seem the only reasonable option. Not only could I not work, earn money, or drive, I could barely connect with my children. Try to imagine maintaining a relationship with an elementary age child when you are in so much pain that coherent thought is difficult. Children, especially the little ones, take a degree of focus. I didn’t realize I was checking out of life: I thought I was trying as hard as I could. What I was mostly doing was drifting into imagining being in heaven. My life on earth seemed to be over, and so I distracted myself by thinking about my next life. I found books about heaven, looked up stuff on the internet, drifted off to sleep thinking on those things rather than the wreckage of my current circumstances. Then, out of nowhere really, I felt God say to me, I want you to stop thinking about heaven. I thought, Now I am well and truly boxed in. My life here on earth has been taken away, and now I don’t even have the escape of thinking about my next life. Sometimes I’m not sure God is telling me something, but this time I didn’t have any doubts. There was nothing to do but stop my internal obsessing over heaven. Instead, I thought about my life and my family, to the extent that I could think at all. Oddly enough, God seemed just as much on my side as ever, despite my general uselessness. Without a distraction, I had no choice but to do what the pain told me; it was bigger and tougher than I was, and perfectly willing to deck me. The pain did not play fair. Although I had always pushed myself to the limits of endurance, the pain said I was done with that. Gone were the days I would be up the entire night at a birth, clean and pack our medical equipment, arrive home just in time to get the kids ready for school, do the school trip, grocery shop, clean the house, and go pick the kids up. Now my kids rode the bus. I had to go lay down multiple times during the day. If I didn’t listen when the pain whispered, it shouted. What was happening? I was suffering through daily pain, my carefully laid plans were in tatters, and I was happy. I felt God in my life; I felt Him in my pain. Sometimes the pain seemed to say, He is with you. Right here, right now, here He is. I have no theological frame for this experience, only that God met me in the most unlikely of guises. And then the strangest thing of all. Back at the beginning of the onset of chronic pain, God told me to stop thinking about heaven; and then, about a year later, I found myself writing about heaven in my prayer journal. Writing about it a lot. I know You told me not to do this, but somehow it feels different now, I said to Him. It is different now, I felt Him reply. Now you can go ahead. You’re in a different place, and I want to share things about heaven with you now, when they build your life, instead giving you an escape from it. Things about heaven began cropping up in my prayer journals, ways to manage this life while focusing on the next, fully present in both. My sense of that undiscovered country grew deeper than it had ever been. 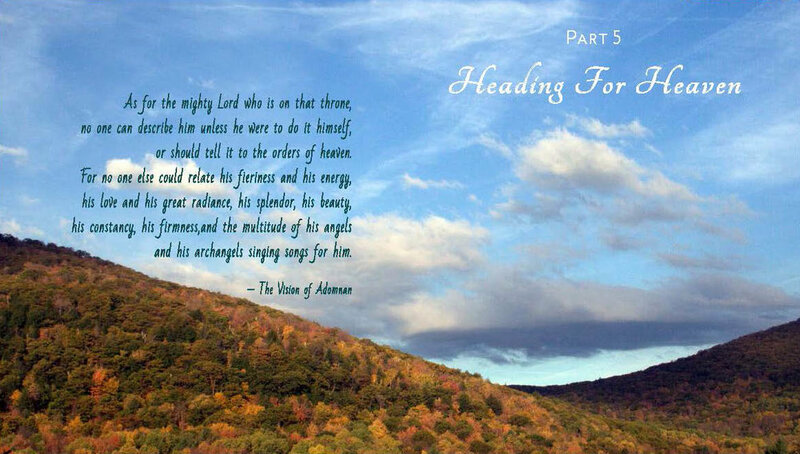 The readings that make up the last section of Messages from God: An Illuminated Devotional, “Heading for Heaven,” are mostly excerpts from my journals from that time. Heaven came close for me, and the lessons of pain made me ready.